Sharing laughs with attendees of a recent retirement planning workshop. The lady next to me will turn 101 in October! Are people really living longer? 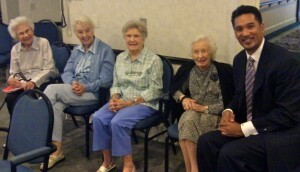 Absolutely, I just held a financial workshop @ a retirement community in Wilmette. The average age of each attendee there was 85+. In addition, I noticed a lady sitting there with the best energy and eye contact in the whole room. When I had a chance to speak to her afterwards, she told me she as 100! AND, turning 101 in October! You go girl!! I was honored to have shared with her what I knew about helping her better plan for more predictable income past six-digit years! Is this really going to affect a lot of people? Moving the retirement further away will definitely affect those who have been paying into the Social Security system for many years and looking to retire from their jobs in the next ten years. People like my own Mother who has put in 30+ years for one of Chicago’s public hospitals that care for people with no healthcare insurance. Although many believe Social Security Income (SSI) will not completely replace their current income, it is still significant enough to be forced into a position of receiving this money several years later, forcing them into working longer in life than they expected. For Americans in their 20s, 30s and early 40s, we should be conditioned (if not already) to not expect much income from SSI in our later years more than enough to pay our cell phone bill. If we get more than that…it’s a bonus! Should we really care? Absolutely. You are currently paying into the Social Security system through your income taxes (that’s Uncle FICA saying “thanks!” on your paycheck stub) and depending on your age, may never reap much income benefits from it. In this year of 2010, Social Security is paying out MORE in benefits than it is taking in from payroll taxes. Not a good way to run a business, personal budget…much more the Social Security system! Where is our Social Security currently being invested? According to the Social Security website, the funds are being invested in “special issues” that are only available to trusts. Their effective interest rate in 2009 was 4.9%. What can people do to better themselves financially for retirement? Take control and take charge of their own personal financial future. Do not wait for what Obama, the government, your employer or family members will do. YOU are on your own, any help from outside your own financial home is a BONUS. Get a grasp of what your financial picture looks like, as difficult as it may be, so that you can make the adjustments now and put time on your side. How do people pay a financial planner, advisor or coach to help them plan for retirement income? There are many ways to get financial guidance. Here are three, 1) Pay for their time. Some may charge an hourly rate or charge a fee that is extracted from the amount of investments you place into their management. 2) Pay Nothing. They get paid a commission from the investments you place into their management which affects your account balance. Or they get a commission from the marketing budgets of the financial institution(s) they represent which will leave your account balance alone. 3) Combination of Both. 4) Do It Yourself. Commit to learning the money game on your own and prepare for making mistakes too. Hopefully you have the luxury of having money and time to burn…unlike the rest of us. Bottom LINE: Paying someone to help you is an investment in YOU, it should not be consider a cost. If someone can help you see more clearly into your financial picture, hold your hand along the way and avoid costly mistakes that would have cost you hundred of thousands, if not millions…is it worth the $500-$5,000 investment to have a financial professional keep you away from these irrevocable errors? Don’t change Social Security Age. The full-retirement benefit age is currently being moved as we speak, under the current plan. Today the full Social Security benefit retirement age is 66 for people born from 1943 to 1954. It then increases by two months for each year (66 years and two months for those born in 1955, 66 and four months for those born in 1956 and so forth), until those born in 1960 or later get full benefits at age 67. Therefore, moving it just three years later to 70 years old for some would greatly impact their lives. Baby Boomers never mentally, some financially and other physically, are prepared to work into their 70s. It’s easy for people to say, “It’s only 3 years!” Sure, but have you been in a 65 year old’s shoes when they have to deal with long-endured work related stress, personal health issues, family responsibilities of taking care of their parents AND their own kids who moved back home after college because they can’t get a job? Then what do I propose? Increase one’s personal knowledge of their personal financial situation with a financial professional/financial coach/trusted advisor…and get creative! Take control of your future income! Look for ways to optimize assets you currently own. Redefine what retirement is and consider turning a hobby into a profitable entrepreneurial enterprise. Redefine what money means to you and how much you need to be happy and fulfilled. Don’t wait for someone to bail you out or wave a magic wand over your checkbook. Get what you know needs to get done because this problem isn’t going away. Veronica Smith No it is not fair and yes, I care. Maritza Pinto it’s not fair. it’s bad enough that I may not be able to get back some of my contribution when it IS time to retire but to have me keep putting in the kitty… I might as well pay someone’s rent or mortgage starting now. Brenna Rosales Let’s get a better health system in place first. Then extending the retirement age wouldn’t be such a big deal. Carlos Frank Gotta care since this impacts all of us, whether we like it or not. Keep up the great work Matthew! Jeff Berlat Yes, as the population gets older, SS needs to push back the date to receive benefits. If people in their 20’s are taught to not depend on SS, then they can save more and not have to worry about it. They should raise the phase out or get rid of it to get some additional dollars in, instead of taxing the rich, even though this taxes those that make more than 108K a year. Col. Sanders didn’t start KFC until he was 67. Really, at some point a person who is 21 starting a career might never see SS. Ilona Lydia Tervola I keep thinking about the Boeing study that showed a age/retirement status…..and how the Quality of living/yrs. lived was MUCH higher for those that retired earlier in life…Hardworking ppl deserve quality in the years they have left after retirement….I am voting for a younger retirement age. On the other hand….I do not plan on SS to sustain me….making it happen NOW with fierce determination and hard work! Great question Matthew! Ray Buckner Yes. Retirement is no longer an age but a number. What is your financial independence number? Tia Good Yes I care. You should not have to work yourself until you have a foot in the grave. Big THANK YOU to the FOX News Radio Network in allowing us to share our thoughts and ideas! To book me for future media appearances, please contact Mark Goldman of Goldman McCormick PR @ (516) 639-0988! Good read. I think that it is really important that people give importance to their financial status, goals and stability. Definitely a must-read for those who need help. Yes I care, I am over 60. All of my financial planning has been geared to SS at 66.5. I can’t make up for that now.